Half our household is surfing in Tofino right now. Steph’s busy working or volunteering and everything else that she does, leaving just Mye and I alone most of the time. I have been sick with a cold lately. It set in shortly after we came back from Salt Spring and it doesn’t seem to want to go away. 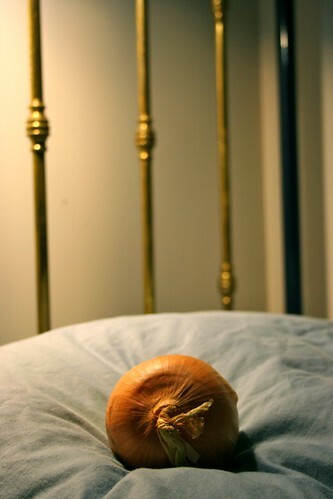 Mye told me that the solution to this is to keep an onion beside my bed. Apparently this is going to cure me. I don’t suppose it will hurt. This entry was posted on Wednesday, May 5th, 2010 at 9:20 pm and is filed under Uncategorized. You can follow any responses to this entry through the RSS 2.0 feed. You can leave a response, or trackback from your own site.